A 50/50 blend of cotton and polyester are used to give Carhartt's Graphic Carhartt 89 Zip-Front Sweatshirt a comfortable, flexible fit and feel. The brass front zipper shows the premium quality of the sweatshirt's construction, and two front hand warmer pockets are there to help you keep toasty when the temperature drops. 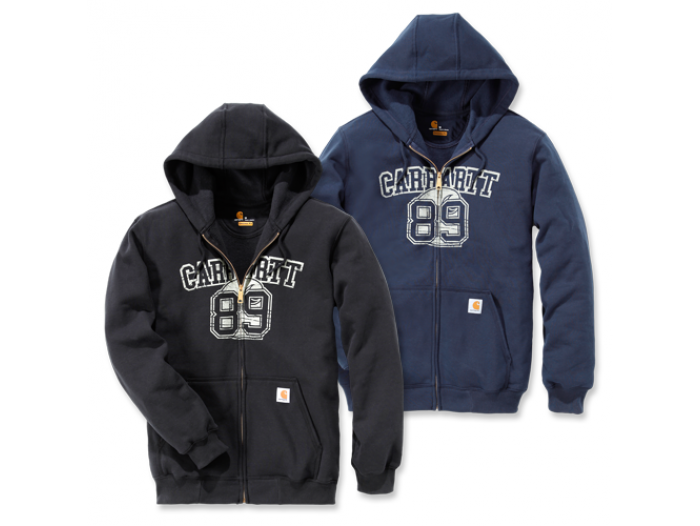 Carhartt's signature logo is sewn onto the front and a graphic is printed on the chest. Three-piece hood with draw cord closure. Two front hand warmer pockets. Stretchable, elastane reinforced rib-knit cuffs and waistband. Carhartt label sewn on pocket.